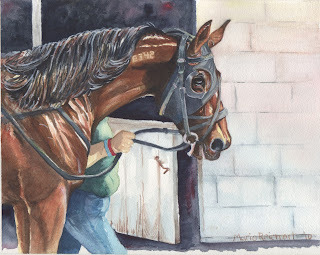 "Back to the Shed Row"
Ok I have finished my last painting of the horse returning to his stall after his race. I was a little disappointed in that I lost his mane to the dark background and I had to add a little white to the mane to make it stand off the dark stall, after all the mane in the sunlight was what I liked most about the picture! Hope you like it, I would love some input, pointers. I don't know that I would've done anything differently. I think the mane stands out and holds it's own nicely. This is a very nice piece Maria. Thanks for sharing. 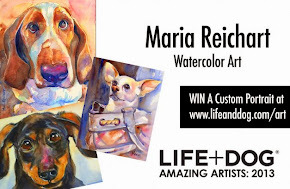 Maria, thanks for visiting and commenting on my blog. This is lovely piece...horses are always so challenging , but you have handled it so well. happy painting! Thank you Julie, I find it motivating to share my paintings and view others' work on the blogs, keeps me running back to the paint brushes to try just one more thing! I look forward to your next piece, I enjoyed your paintings of Italy as well.